Kim Min-hee, left and Isabelle Huppert on the beach in Cannes, France, in Hong San-soo’s film Claire’s Camera. Claire’s Camera feels like the thinner, lesser effort to me, even though stars Isabelle Huppert and Kim Min-hee do seem to have a genuine rapport. The film was shot at the 2016 Cannes Film Festival and shown at the 2017 edition. So very meta! Kim Min-hee plays Jeon Man-hee, a sales agent at a Korean film company. Man-hee is astounded when her boss, Nam Yang-hye (Chang Mi-hee) invites her out for coffee and then fires her in a puzzling, roundabout way. She mentions Min-hee’s good nature and big heart but also accuses her of being dishonest. We have no idea what she’s talking about and clearly Min-hee doesn’t, either. Does the boss think Min-hee has been dipping into the petty cash? Actually, the problem is love, not money. Though other reviewers have gone into more detail about this, I’ll just say that it would have been more logical for Nam Yang-hye to be angry with Director So Wan-soo (played by Jung Jin-young). He is at the festival to show his film and she is there to promote it and sell its rights. Of course, humans are not always logical and Nam Yang-hye is not in a position to fire Director So, either. Isabelle Huppert plays the Claire of the title. She is a school teacher on vacation who has come to Cannes for the first time. (Cue laughter from the film audience, since Huppert has been there many times before. More laughter when she tells Director So that French “is a very difficult language to learn.”) The camera of the title is a Polaroid, which makes it easy for Claire to show her photos to others, or to give them away, if she chooses to. She claims, in a New-Agey kind of way, that her subjects won’t be the same after she takes a photo of them. It’s like a cousin of the belief that a photo will steal your soul. Jung Jin-young, left and Isabelle Huppert in Hong Sang-soo’s film Claires Camera. I did not hate Claire’s Camera by any means, I just found it to be a little thin. It’s only fair to say that there are many reviews on the Internet written by people who enjoyed it more than I did. Check them out, too! 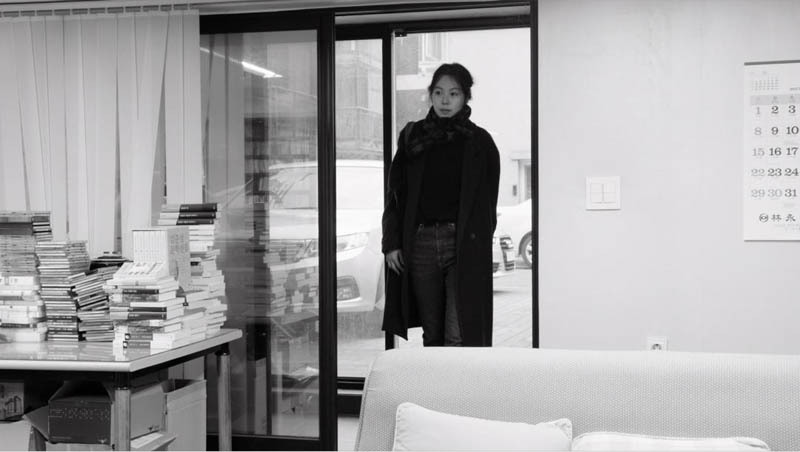 In this scene from Korean film The Day After, Song Ah-reum (Kim Min-hee) is ready to begin her first day working at a small publishing house. The Day After is directed by Hong Sang-soo. On her first day at a new job, Song Ah-reum (Kim Min-hee ) is insulted and slapped by the wife of her boss, Kim Bong-wan (Kwon Hae-hyo). Kim runs a small publishing house and Song is his only employee. Song had no way of knowing that Kim had been having an affair with her predecessor, Lee Chang-sook (Kim Sae-byeok). Now that she does know, is she seeing the “getting-acquainted” lunch she just had with him in a new light? Was he grooming her to be his next conquest? Kim keeps saying “it’s not her!” but his wife, Song Haejoo (Jo Yoon-hee) does not believe him. Song Ah-reum’s forehead is wrinkled in thought as she watches the two of them bicker. Their marriage might be in trouble, but they still have a bond of sorts, after all, while she is the true outsider. As a woman, she might naturally sympathize with Song Haejoo, but not after being hit several times and being called a shameless hussy (or the equivalent.) Her boss HAD seemed like a nice guy (though maybe a bit condescending). Obviously, he isn’t so nice, after all. “A man behaving badly” would describe most of the Hong Sang-soo films that I’ve seen, and it certainly fits The Day After. While Kim’s wife frequently calls him a liar, he usually just clams up and says nothing at all, or asks “Are you serious?” rather than answer her questions directly. Confrontation! In this scene from HongSang-soo’s film The Day After, Song Ah-reum (Kim Min-hee) left, watches her boss, Kim Bong-wan (Kwon Hae-hyo) argue with his rightfully suspicious wife, Song Haejoo (Jo Yoon-hee). The film is shot in black and white, and moves around in time, as Hong’s films usually do, showing Kim Bong-wan at home (not very often!) in his office, and in restaurants eating and drinking (drinking a lot!) with Chang-sook or Ah-reum. We see Kim on the streets, too, walking with one of the women or by himself. He walks a lot, because he’s trying to figure things out, because he lives far from his office, because he has a guilty conscience? Could be any and all of those. Much of this walking takes place in darkness, at night, or in the very early morning hours; it’s not always clear which. At one point he tries to jog, seemingly confirming his wife’s suspicion that he is trying to improve his appearance for someone other than her. Sometimes Kim Bong-wan even cries on his solitary walks, but I’m not at all convinced that this means he loved Lee Chang-sook, maybe he just misses having someone, other than his wife, to be with. And drink with. I wonder: Does Hong Sang-soo know about U.S. comedian Stan Freberg? At one point, the two lovers are locked in a passionate embrace while they exclaim “Bong-wan!” “Chang-sook!” over and over. Do a Google search on “John and Marsha,” you’ll see what I mean. Things I found amusing: When Kwon Hae-hyo eats with his wife, he slurps his soup and munches his kimchi very noisily. He is much more restrained when eating with his assistants. Meta or gossipy aspect: Director Hong Sang-soo left his wife of many years for actress Kim Min-hee, who has now appeared in four of his films. You might know her from Park Chan-wook’s film The Handmaiden. Montrealers can see The Day After at the Festival du nouveau cinéma on Sunday, Oct. 15, 2017 at 5:30, in Salle 17 of Cineplex Odeon Quartier Latin, 360 rue Emery, métro Berri-UQAM. Lee You-young, centre, as Minjung, with two of her drinking buddies, in the Hong Sang-soo film Yourself and Yours. Yourself and Yours, the latest film from Korean director Hong Sang-soo, looks at relationships in a way that’s insightful and hilarious. (Well, I thought it was hilarious.) I guess someone who has recently broken up with a significant other might feel differently. After hearing gossip from a friend, Youngsoo (Kim Joo-hyuck) accuses his girlfriend Minjung (Lee You-young) of drinking with other men. Quite apart from the jealousy angle, he is upset because she had promised him to cut way back on her drinking. Youngsoo starts moping around pathetically. He tells his friends how much he loves Minjung, how special she is, that others don’t understand her, etc. All this might come from genuine love and regret, though I suspect it comes from loneliness or a feeling of having lost control of this situation, and his life in general. Who knows, really? Seeing her had probably become a habit for him, as well, and habits are notoriously hard to break. There are several scenes of Minjung, or someone who looks just like Minjung, drinking with other men. When they first speak to her, they claim to know her from some other occasion. Some of them are rather agressive in their insistence that they know her; it verges on creepy. She says that she never saw them before, but does agree to drink with them now. Minjung seems more humourous and interesting to know than Youngsoo is. Her daring, if slightly rude habit of telling men exactly what she thinks of them is not something we see too often in Korean films; it’s still a patriarchal place. It’s likely that many of these scenes, maybe all of them, only take place in Youngsoo’s unsettled dreams or waking imagination. That would be consistent with Hong Sang-soo’s style, but I have other reasons for thinking so, too. Sharing those reasons might constitute “spoilers,” though, so I’ll keep them to myself for now. You could have lots of fun dissecting those scenes, and the film in general, with friends after the film, maybe over a meal at a Korean restaurant. Have some soju! Sadly, you aren’t likely to find the milky alcoholic beverage ( 막걸리 makgeolli, makkoli, makgeoli, etc.) in Montreal restaurants. That’s the stuff that the characters in Yourself and Yours drink from metal bowls, when they’re not having beer or soju. A little laugh of recognition for people who follow Korean pop culture: At some point, Minjung talks about her “ideal type.” In interviews, Korean singers and actors are always being asked about their ideal type. They usually name other singers and actors and then their fans have fun discussing these choices on the Internet. I’d read several enthusiastic reviews before seeing Yourself and Yours, and assumed that I would enjoy it, but It actually surpassed my expectations. For those who have heard of Hong Sang-soo, but haven’t seen his work yet, Yourself and Yours would be an excellent place to start. His Montreal fans have probably bought their tickets already. Yourself and Yours, directed by Hong Sang-soo, with Kim Joo-hyuck, Lee You-young, Kim Eui-sung.